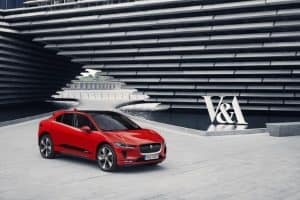 Jaguar has chosen Scotland’s first dedicated design museum to display a bespoke full-size clay model of the brand’s I-Pace electric SUV. Created by world-renowned designer Ian Callum, the model took centre stage at the grand opening of the new V&A Design Museum in Dundee on September 15th, highlighting the global achievements of Scottish designers past and present. Jaguar says the clay model demonstrates the painstaking and elaborate design process behind the steps followed to create every new Jaguar. Ian Callum, Jaguar’s design director, said: “Automotive design is hugely complex. Although much of the design is done digitally, clay models are still important – they are our first chance to see the car in reality. He went on to acknowledge Scotland’s long history of design excellence and hailed the V&A Dundee as a fantastic opportunity to showcase this on a global stage. “It has been an honour as a Scot to be involved with the opening of the new museum, and I hope our I-Pace exhibit can help inspire the next generation of design talent,” Mr Callum added. Away from cars, the new museum will bring touring exhibitions from other international museums to Scotland, as well as curate its own exhibitions.